At Schwinn, we are committed to the safety of our bicycles and the Schwinn Quality standard, using over 120 years of cycling heritage, passion and expertise to guide us. Following reports that some Schwinn Abbott Adult Men’s Mountain Bicycles developed cracks in certain situations, we decided to work with the U.S. Consumer Product Safety Commission to conduct a voluntary recall of these bicycles. There has been one injury reported in the 17,600 units recalled. 2018 Schwinn Abbott Adult Men’s Full Suspension Mountain Bicycles that are black with green, yellow and blue accent colors, and were sold exclusively at Walmart from February 2018 through August 2018. “Schwinn” is printed in green and yellow on the down tube of the bicycle and “Abbott” is printed in blue on the top tube of the bicycle near the bicycle stem and handlebars. WHY ARE YOU DOING THIS RECALL? Despite passing extensive industry and regulatory testing, Schwinn recently received reports that some Schwinn Abbott Adult Men’s Mountain Bicycles developed cracks in certain situations. Safety is always our number one priority, and as a precaution Schwinn approached the CPSC to conduct a voluntary recall of the product. We regret this incident and are taking all necessary steps to remedy the situation with a minimum of inconvenience to consumers. Pacific Cycle has received reports that some consumers have experienced issues with the front wheel coming loose on certain models of swivel wheel jogging strollers that have a quick release mechanism for rapidly removing and re-installing the front wheel. The front wheel can pose crash and fall hazards if it becomes loose and detaches. We are working with the U.S. Consumer Product Safety Commission (CPSC) to provide a repair kit. The impacted strollers include Single and Double Occupant models from the following Pacific Cycle brands: Instep Safari, Instep Grand Safari, Instep Flight, Schwinn Turismo and Schwinn Discover. The strollers were sold nationwide from January 2010 through June 2016. Please watch the following video for more information about the repair kit. At Pacific Cycle we are dedicated to the superior quality and safety of our outdoor recreation products. We are taking all necessary steps to remedy the situation with a minimum of inconvenience to consumers. About 218,000 swivel wheel strollers that have a quick release mechanism for removing and re-attaching the front wheel, including the following Single and Double Occupant models: Instep Safari, Instep Grand Safari, Instep Flight, Schwinn Turismo and Schwinn Discover. The strollers were sold nationwide from January 2010 through June 2016. A complete list of model numbers is below. These models come in a variety of colors. The model number is located on the inside of the metal frame above the rear right wheel. Consumers should stop using the recalled strollers and contact Pacific Cycle to obtain a repair kit. The repair kit includes a replacement mechanism for securing the front wheel that uses a traditional screw on/off method of attachment instead of the quick release lever method of attachment shipped with the product. The repair kit is expected reduce the risk of the front wheel detaching. Consumers should not return the jogging strollers to retailers where purchased. At Schwinn we are dedicated to producing the highest quality bikes and accessories on the market. Schwinn is a family friendly company made up of moms and dads, and grandmas and grandpas, and aunts and uncles and our own children regularly use our products. We know that safety is your number one priority when buying one of our helmets for your child and it’s our number one priority when producing one. We are committed to the safety of our helmets and to the Schwinn Quality standard, using over 120 years of cycling heritage, passion and expertise to guide us. The Magnetic No-Pinch Buckle Infant Helmet sold exclusively at Target. The helmet and its straps come in various colors and design patterns. The buckles have small plastic covers and enclosed magnets. 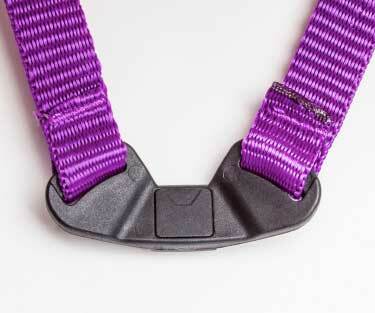 Only helmets with the unique type of magnetic no-pinch chin strap buckles shown below are affected by this recall. WHAT IS THE VOLUNTARY RECALL FOR? 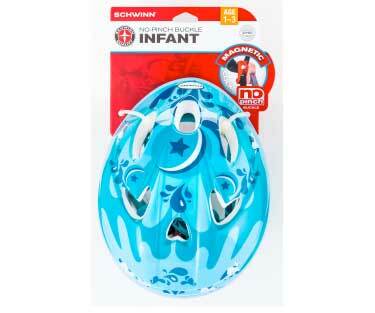 Despite passing extensive global industry and regulatory testing, Schwinn has recently received three reports that the magnetic chin strap buckle on the Magnetic No-Pinch Buckle Infant Helmets sold exclusively at Target has small plastic covers and magnets that may come loose due to inadequate adhesive, posing a potential choking and magnet ingestion hazard. There have been no reported injuries among the 129,000 chin strap buckles sold since January 2014 that are being recalled. Safety is always our number one priority, and in an abundance of caution, Schwinn approached the CPSC to conduct a voluntary recall of the product. Consumers should immediately take the helmets away from children and contact Schwinn for instructions on how to receive a free replacement helmet. This recall involves bicycles with SR Suntour bicycle forks models M3010, M3020, M3030, NEX and XCT. The recalled forks have serial numbers in the top row beginning with “K” and ending with a number between 141101 and150127. The fork model and serial numbers are located on the back of the fork’s crown. The serial number is the first row. The model number is in the second row. “SR Suntour” is printed on stickers on both sides of the fork legs. A detailed list of the serial numbers included in the recall is on the firm’s website. Contact SR Suntour toll-free at (888) 820-8458 from 9 a.m. to 4 p.m. CT Monday through Friday or online at www.srsuntour-cycling.com and click on Safety Recall Notice for more information.